Bocage lived in a time of evident crisis. The economy was fragile. The broad and radical reforms undertaken by Marquês de Pombal were systematically perverted. The indigent people were afraid of his impotences. Bocage, in addition to poetry, composed satirical poems covering regime’s people and the clergy, which has not pleased obviously the power. 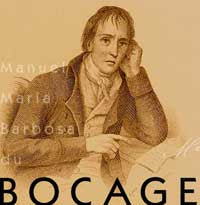 Censorship pursued Bocage throughout his life. Many lines of his poems were cut, others ostensibly changed, and some poems only appeared posthumously. For this reason it is plenty understandable his desperate yearning for freedom. In a transitional, troubled, convulsing period, his work reflects this instability. On the one hand, it reflects the influence of classical culture, cultivating his genres, appealing to the mythology, using authentic vocabulary; on the other hand, it is a pre-romantic because he sets himself free from the webs of reason, overflows with intensity all that is in his soul, torrentially expresses his feelings, defends loneliness. It is well known Bocage’s irreverent character. Indeed, he wrote merciless satires, severe criticisms to the society’s model, to the government, to the powerful ones in general. The social conventions, clergy, doctors, greedy and writers, among others, were also subject of his careful observation and his corrosive criticism. He consubstantiated the voice of the oppressed people, but always with a critical tone, that compensated with laughter, with the caricature and ridicule related with his legitimate dissatisfaction. On a day when he was bored. 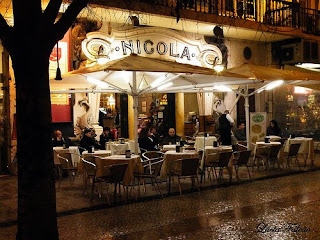 Place for exchanging ideas, literary debates and propaganda of opinions, that's how we can define one of the most fashionable coffees of the eighteenth century. Founded by an Italian in Rossio, Nicola Breteiro, this is one of the oldest establishments in Lisbon.